I’m a little obsessed with eggs this year – if you haven’t noticed. First I blew 100 quail eggs for Easter, then I’ve been debating getting chickens at the new house for fresh boiled eggs with soldiers, and on Sunday I almost visited an Ostrich farm (we found out at 4.45pm it closed at 5pm, another time maybe). 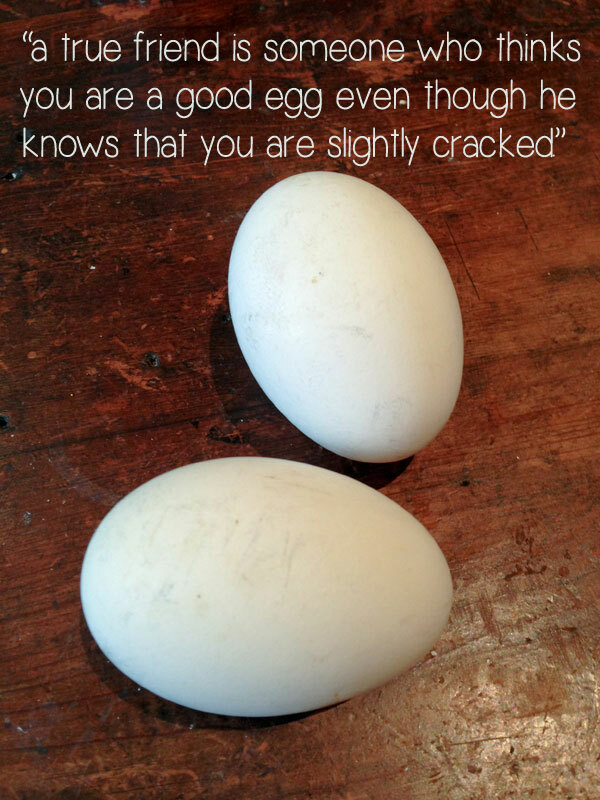 So when I was given the gift of a farmers’ market goose egg it was as if I’d been given a Fabergé egg – what to do with said precious egg? 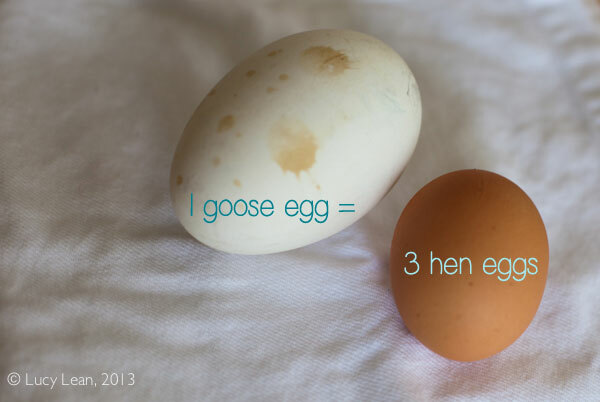 A goose egg is about 3 times bigger, and the ratio of yolk to white is more, than a hen egg – making it perfect for baking. People who know about these things swear cakes taste better when you use goose eggs in the batter. As good as cake sounded I wanted something where the egg is the thing. I would use my goose egg with its golden yolk to make of a special supper for two. I would make an omelet. When Robespierre said “On ne saurait faire une omelette sans casser des oeufs.” translation “One can’t make an omelet without breaking eggs” just what exactly was he referring to in the French Revolution? The Reign of Terror? The fact that Louis XVI and Marie Antoinette must die so the country may live, they would both have to be guillotined, along with thousands of aristocrats? Given this, my guess is the Queen would have chosen les gateaux over la omelette. Let them eat cake has some credence in this context, mais non? Enough of the French histoire and on with my omelet – time to casser des oeufs. 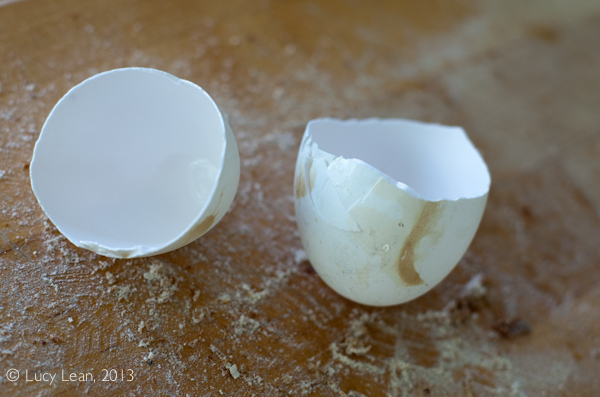 I broke the goose egg and then immediately regretted not blowing it and saving the shell for some worthy crafting project – there really was no time and I was a little blown out post quail egg challenge. 1. 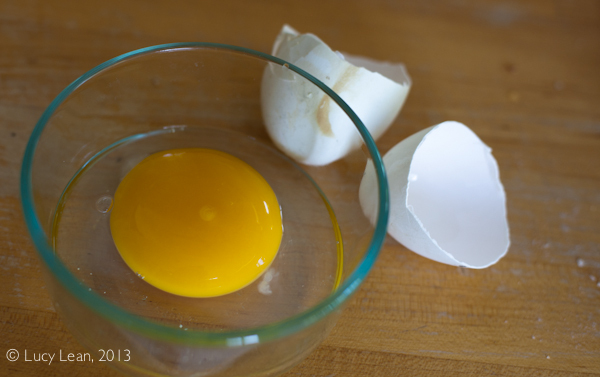 Break the goose egg into a large bowl and beat well with a fork. Season lightly with salt and pepper. 2. In a non-stick pan, heat the corn oil and butter on medium-low heat. Add the onion and cook until tender and translucent. 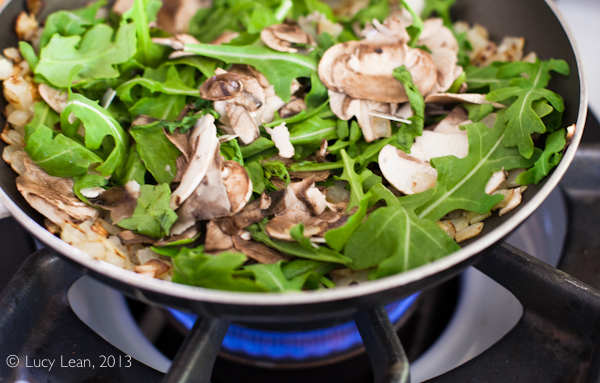 Add the mushrooms and arugula and cook through for a minute. Transfer to a plate and set aside. 3. Return the pan to the heat and increase the temperature to medium-high and pour in the beaten egg. Shake the pan vigorously until the eggs start to thicken, then stop as the mixture browns. 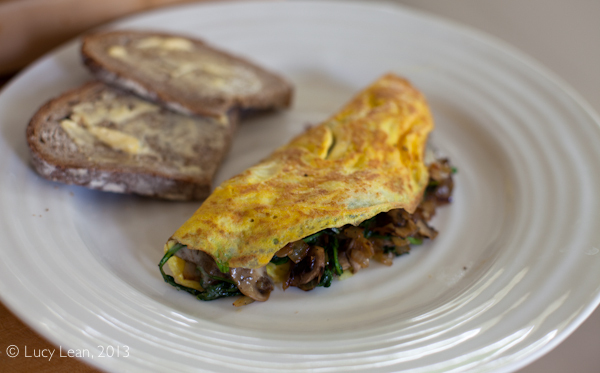 Add the sautées onions, mushrooms and arugula to the egg and top with the fontina cheese. When the omelet is almost cooked through and the cheese has started to melt, carefully fold one half over onto the other half and transfer it to a large platter, preferably warmed. Divide the omelet in half and serve immediately with buttered country bread. “Although I cannot lay an egg, I am a very good judge of omelettes” so said George Bernard Shaw. My Fair Lady thinks this omelet is a bit of all right! 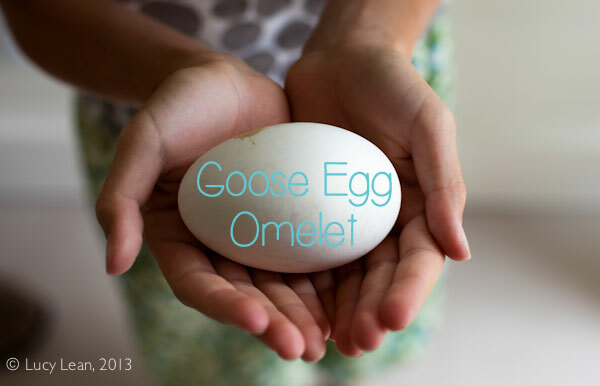 Thank you golden goose for the egg that led to the omelet. and fascinating history and references. Thank you for sharing such joy.